This example demonstrates the default interpolation method that is used by the GRID statement. The example first generates a scatter plot of random data to show the concentration of data values before processing the data set with the G3GRID procedure. The original data does not contain enough combinations of x, y, and z values to generate a surface plot with the G3D procedure or generate a contour plot with the GCONTOUR procedure. The example then runs the G3GRID procedure to interpolate additional x, y, and z values. Because no interpolation method is specified, the default interpolation method is used. 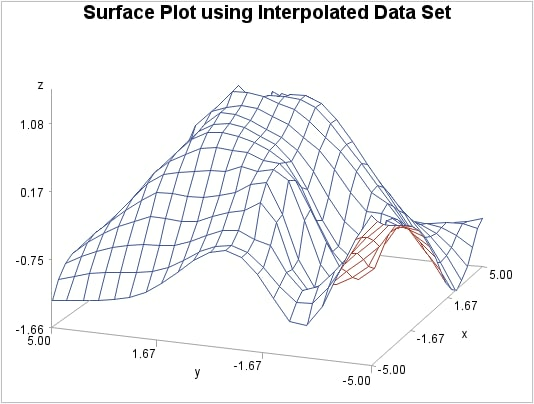 The resulting output data set is used as input to the G3D procedure, which generates the surface plot shown in the following output. Create data set. 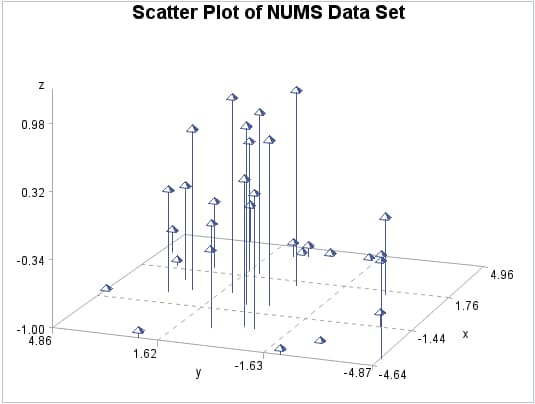 NUMS uses a set of randomly sampled points to create the data used in this, and all remaining examples in this chapter. Define the title for the plot. Generate the scatter plot with PROC G3D. Grid the data with PROC G3GRID. The OUT= option on PROC G3GRID specifies a name for the temporary output data set. The GRID option specifies the variables Y*X=Z for the output data set. The AXIS statements define axes ranges. Generate the surface plot. The G3D procedure using the G3GRID procedure's output data set as the input data set.